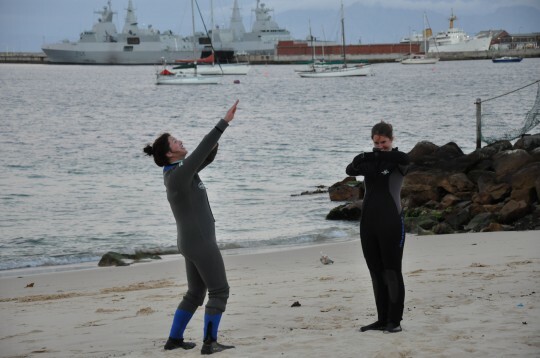 Congratulations to Kate, who arrived in Cape Town on 8 October 2010 having never dived before, and is leaving on 10 December qualified as a Divemaster, with more than 60 dives and over 45 hours underwater under her belt! While she was here we dived almost every day, in all sorts of conditions. 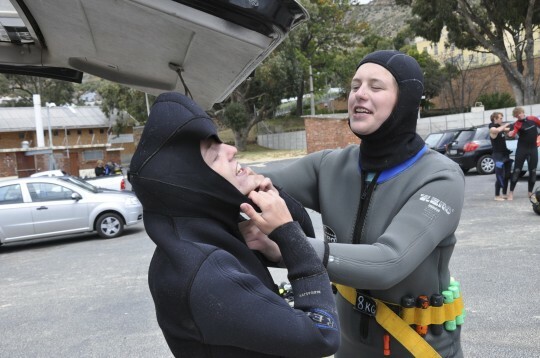 She dived in visibility ranging from pea soup (with croutons) to over 10 metres, water temperatures from 11 degrees up to 18 degrees, and experienced a wide range of what Cape Town diving has to offer. She even did a dive in just a shorty wetsuit – the water LOOKED warm but wasn’t – and I am pretty sure she’s the first diver EVER to do something like that in this city! She experienced everything from orally inflating another diver’s BCD at 15 metres, to securing Clare’s cylinder when it came loose (oops! 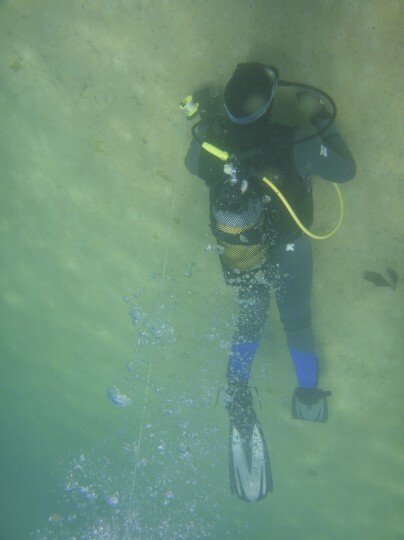 ), tying knots underwater, a meeting with a very frisky sevengill cowshark on her first ever dive with sharks at Shark Alley, and using a lift bag to ferry our artificial reef out to the correct depth. She spent a lot of time towing the buoy line, inflated SMBs and balloons underwater (the latter was highly amusing to watch), mapped wrecks and the pipeline at Long Beach, exchanged information on the layout of the SAS Pietermaritzburg with wikivoyage guru Peter Southwood, enjoyed high-speed boat rides to various local dive sites, filled cylinders at a local dive centre, and navigated at night in order to find the yellow buoy at Long Beach. She’s breathed from a hang tank at a safety stop after a deep dive, and from another diver’s octo while swimming to shore. She’s a pro with a compass. She’s also done some underwater photography – thanks to her, the gobies at Long Beach have a serious complex about the paparazzi! Kate and Clare getting their bearings on the beach. To infinity and beyond! Kate dived with and without a computer, in various types of gear and several different wetsuits. She knows the difference between an A-clamp and a DIN fitting. She removes and replaces inserts on cylinders with her eyes closed, changes O-rings, and puts on her own kit. She has filled over twenty cylinders as part of her compressor operator course. Kate was also a fantastic ambassador for diving for the various students of mine that she interacted with. 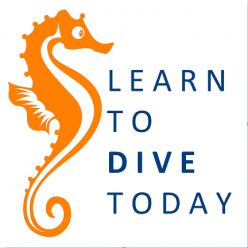 As part of her Divemaster training, she led dives, demonstrated skills, helped students with their kit, and took on various tasks in order to prepare her for the responsibilities that go with this qualification. She did all of this with good humour, good sense and great precision. 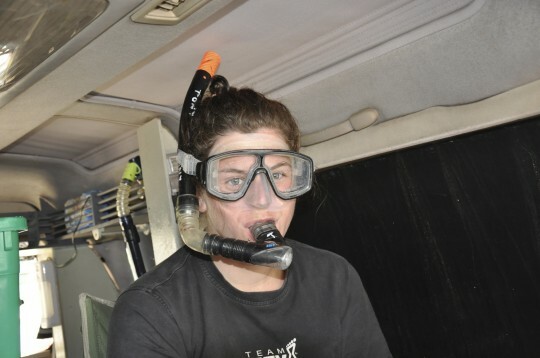 During her stay, Kate buddied with all kinds of divers. She met Russians, Swedes, Canadians, French and fellow British divers, and some regte egte South Africans. She assisted foreign-language students with understanding the questions on the quizzes and exams when their English wasn’t up to the task. She got on famously with everyone she encountered, and was never grumpy or a prima donna. 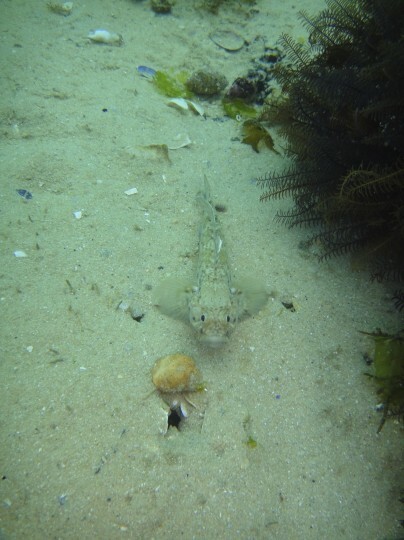 In the ocean she encountered seals (she’s not a fan), giant short-tailed sting rays, hundreds of octopus, sevengill cowsharks, and her favourite friends – barehead gobies! They’re going to miss you, Kate… And especially your underwater singing! Look at that sad little goby face! 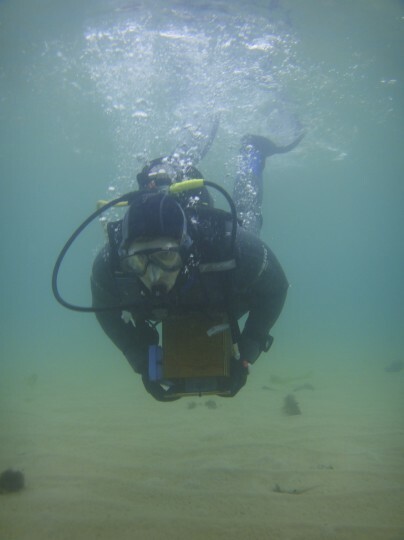 I am confident that she is a safe, capable diver with excellent experience under her belt so far, and I look forward to hearing about her future exploits in the underwater world.